Foot and Ankle Resource: Why do diabetics need to be concerned about their feet? Why do diabetics need to be concerned about their feet? There are many reasons why diabetics need to be especially careful in regards to their foot and ankle health. One of the most important reasons is because of lack of sensation in the feet. This is called neuropathy and it can affect the hands or other parts of the extremities. The nerves become damaged over time, often irreversibly. The reason for this is because a person with diabetes has too much sugar (glucose) running through their blood stream and this eventually clogs up the small arteries. Every structure in the body has blood vessels and therefor every structure can be affected by diabetes. Each nerve has a very small blood vessel attached to it providing nutrients and health. 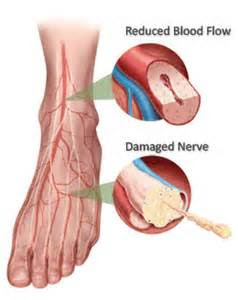 If these blood vessels (vasanervorum) become clogged up, the nerve stops functioning. This causes numbness in the feet. With numbness, you will not sense pain the way a normal person does. You may step on things and not know it. Blisters may develop and turn into wounds without you knowing it. Surfaces may be hotter than you realize and you may get burned but now know it until it is too late. In addition to lack of sensation from nerve damage as seen above and the resultant ulcerations, a diabetic has a poor immune system. The immune system normally functions to fight off minor infections and to allow injuries to heal. When this is damaged, infections can quickly get out of control and everything heals much slower. A wound that could normally be treated and heal without complications can get quickly out of control in a diabetic and even become limb and life threatening very easilly. Some of these infections can spread from a small ulcer on the foot up past the ankle within 24-48 hours. These pictures above demonstrate how devastating a diabetic infection can be. This patient required urgent surgery to open this infection and get rid of it. This infection started approximately 48 hours before he came to the hospital for treatment. We were luckily able to get rid of the infection but we were unable to save the foot. The skin over the ankle and around the heel continued to get worse and the patient would not have been healthy enough to survive the multiple surgeries that would have been needed to try to save the foot. Due to how sick the patient was, a below knee amputation was performed. Oftentimes diabetics will have poor blood flow to the lower extremity which adds to the difficulty of healing on top of a poor immune system. Diabetes, in most cases, is caused by a poor diet. Approximately 90% of diabetes is diet related. This means that if it is caught early it is reversible. Most people are unable to change their lifestyle and diabetes continues to get worse. The longer diabetes goes untreated, the more devastating is becomes and the less reversible. In 2012, the cost of treating diabetes was $258 billion dollars!!! This is up by 41% since 2007. This is an astronomical amount of money for a disease that could be treated by lifestyle and diet changes. Approximately 10% of all healthcare dollars goes to treating diabetes. These figures are likely to get worse and worse as less and less people are taking care of themselves. Healthcare costs will continue to rise and diabetes is a significant cause for this. Please visit our site for more information on foot and ankle issues. If you are a diabetic and do not have diabetic inserts for your shoes, please visit our store and protect your feet with these special offloading inserts. By minimizing sheer forces on the bottom of the foot and preventing ulceration, you can help to minimize your own risk for lower extremity complications.